Riding my 5'9 Ben Aipa shortboard is an interesting experience at times. While some gawk at the board as if it were some kind of top secret information, others gasp in bewilderment that Ben Aipa shapes shortboards?" Once they've had their moment with the board they almost always have a comment or story to share about the man himself. Admired, feared and revered, Ben Aipa seems to be winning what he considers the game of life. Whether surfing, shaping or coaching his philosophy that its all just a game, keeps things in perspective, reminding him that the whole object of the game is to have fun. When I asked him about his goals, he didn't hesitate to pour out another cup of wisdom stating that "once you get to a goal, it stops" which is why he doesn't really set goals, but instead meets projections. "Projections" says Ben "are knowing what's going to be there, and BE TheRe." When I cautiously questioned him about this bad boy image he acquired from the early years , he cleverly compares himself to one of his favorite surf spots saying " I got a bad rap, just like Ala Moana Bowls gets a bad rap, and its really not a bad place. Its the guys who kinda only hear about it, then they explode it, without even being there. I never went looking for trouble, it just came my way" He doesn't deny however that the passion which drives him now, was not what inspired him initially. A then 22 year old football player who had just turned down a scholarship to play pro, Ben took up the sport of surfing as more of an obsession and a proving grounds. "I was agressive in my surfing because I was in a rush to get somewhere in the world of surfing and I didnt step over people, I didn't run over people, I just went through people" Ironically, It was a guy who Ben had previously held in a headlock who would start him seriously surfing and turn him on to shaping at a place called Makaha Surfboards. "When I got into board building I settled down," "I think I did,"
Unlike with surfing, Bens motivation to build surfboards seems to have remained somewhat the same throughout time. "The idea of what I wanted to do was to surf my board, not to ride it" says Ben. This ideology and his hands on approach to shaping has allowed him to meet that connection with the change of surfing time and time again. First noted for developing the swallow tail and the stinger, Ben is also largely responsible for bringing back what he calls the "modern day longboard" which he still actively advances today .This past year he has been working closely with a company called Boardworks restructuring a more rigid form of epoxy while engineering his own computer shapes. He currently has 4 models from his own personal dimensions which have the versatility to be produced in both epoxy or polyester foam. Though he offers these more standard models he insists that "every board is a custom board" While he humbly avoids being put on a pedestal as an innovator, he certainly seperates himself from other shapers who he says are like sheep, jumping on every new little tweak that becomes a trend in the magazine. 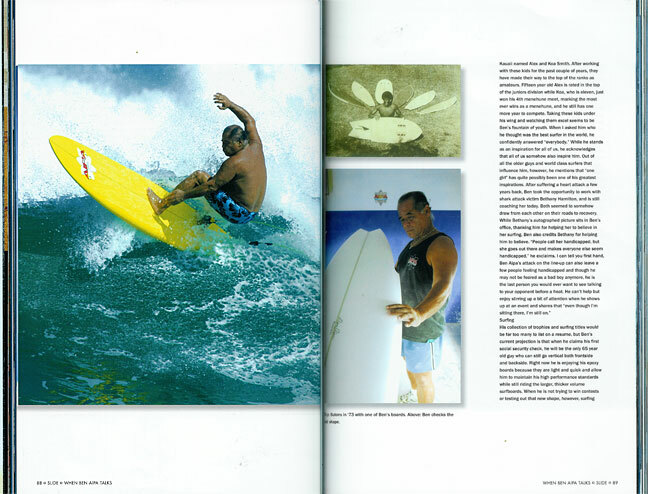 Instead he makes the statement that the sting never left, and explains how he can use designs from a different era of surfing to evolve into todays most progressive shapes. Ben explains how this cycle actually keeps the soul alive in surfing today saying that "the souls gone, its gone in a way, but it comes back in another way." Ben's projection for every board he shapes, is to allow each surfer to simply "continue. "He'll be the one, the vehicle, thats gonna make his vehicle work" says Ben which I guess in turn helps each individual to meet there own surfing projections. After so many years Ben still seems to have that fire for surfing that in some of us dwindles over time. He shares that his involvement with the kids is what keeps the drive in him. "Its the youth, its the movement, its the progression" says Ben with that gleam in his eye which you would only expect to find in a grommet. The spark which kindles him right now is two young brothers from Kauaii named Alex and Koa Smith. After working with these kids for the past couple years they have made their way to the top of the ranks as amateurs. Fifteen year old Alex is rated in the top of the juniors division while Koa, who is 11, just won his 4th menehune meet, marking the most ever wins as a menehune and he still has one more year to compete. Taking these kids under his wing and watching them excel seems to be Ben's fountain of youth. When I asked him who he thought was the best surfer in the world, he confidently answered "everybody" While he stands as an inspiration for all of us, he acknowledges that all of us somehow also inspire him. Out of all the older guys and world class surfers that influence him, however he mentions that "one girl" has quite possibly been one of his greatest inspirations. After suffering a heart attack, a few years back, Ben took the opportunity to work with shark victim Bethany Hamilton and is still coaching her today. Both seemed to somehow draw from each other on their roads to recovery. While Bethany's autographed picture sits in Ben's office thanking him for helping her to believe in her surfing, Ben also accredits Bethany for helping him to believe. "People call her handicapped, but she goes out there and makes everyone else seem handicapped", he exclaims. I can tell you first hand, Ben Aipas attack on the line up can also leave a few people feeling handicapped and though he may not be feared as a bad boy anymore, he is the last person you would ever want to see talking to your opponent before a heat. He can't help to enjoy stirring up a bit of attention when he shows up at an event and shares that "even though Im sitting there, Im still on"
His collection of trophies and surfing titles would be far too many to list on a resume, but Ben's current projection is that when he claims his first social security check, he will be the only 65 year old guy who can still go verticle both frontside and backside. Right now he is enjoying his epoxy boards because they are light and quick and allow him to maintain his high performance standards while still riding the larger, thicker, volume surfboards. .When he is not trying to win contests or testing out that new shape however, surfing is a type of mediation, its a time to sift through his thoughts, relax and become one with the wave. "Surfing its a healing thing, also", says Ben. He shares surfing with a whole family of surfers including his wife Lenore, daughter Lokelani and two sons, Akila and Duke. There is really no better testament to Ben's purpose, than his shaping room. Before you even knock, there is a sign which basically tells you not to bother if the surf is good. Upon entering, you can almost hear voices coming out of the walls which are covered with all sorts of pictures, magazine clippings and family photos. It is in itself, a sort of surfing museum which gives a visual to those stories I hear down the beach. Ben assures me that he while he came from the past, he is staying in the future and doesn't really even look back much. He doesn't regret not having his own retail business or surfboard factory or going more commercial, he just cherishes the journey before him. He takes a deep breath and exhales with a final statement. "I guess what was meant for me to be, is to enjoy what Im doing, thats what was meant to be, to enjoy my board building, my surfing, watching everybody surf, everybody having fun, you know, and to absorb all that feeling, and just go on and on and on."